And behold, the veil of the temple was torn in two from top to bottom; and the earth shook and the rocks were split. 52 The tombs were opened, and many bodies of the saints who had fallen asleep were raised; 53 and coming out of the tombs after His resurrection they entered the holy city and appeared to many” (Mt. 27:51-53). How should we understand and interpret the reliability of this difficult passage? Skeptical readers wonder why this strange event isn’t mentioned by any extra-biblical sources. If The Night of the Living Dead really occurred in ancient Jerusalem (as one skeptical blogger has put it), why don’t other ancient people record this event? Yet Matthew doesn’t state that all OT saints were raised in Jerusalem. Instead, he writes that God raised “many bodies” (Mt. 27:52). From this passage, we have no idea how many OT believers were raised. While we might expect to have seen thousands of people rising from the dead and walking through Jerusalem, we simply do not have an exact number given by Matthew. Moreover, while extra-biblical records do not confirm this report, we don’t have records that discount it, either. We cannot demand an extra-biblical account of this event, because sources are scarce from this time. We can only use an “argument from silence” if we would expect to discover more from history. Yet two factors would preclude arguing for a “conspicuous silence” here: (1) we have limited accounts from the first-century and (2) we have no way of knowing how many OT saints were raised; thus we cannot make such an argument from silence with any level of confidence. It might seem strange that a number of people would rise from the dead. Yet if the God of the Bible exists, it would be no more difficult to raise a number of bodies from the dead, than it would be to raise one individual body (Jesus) from the dead in the next chapter. Moreover, Jesus raised Lazarus (Jn. 11:1ff) and Jairus’ daughter (Mt. 5:38ff) from the dead. Surely the God of the Bible is in the business of raising the dead. In other words, Christians are not arguing that these people naturally rose from the dead. This would be impossible. But if God exists, he would be able to supernaturally raise them to life, as he will with all people at the end of human history. New Testament (NT) scholar Michael Licona is associate professor of theology at Houston Baptist University, and he has recently written a persuasive book called The Resurrection of Jesus: A New Historiographical Approach (Downers Grove, IL: IVP Academic, 2010). Evangelical scholars have widely praised him for his careful thinking and exhaustive research on his defense of the resurrection of Jesus. Licona is a dedicated defender of the Christian faith, debating everyone from skeptics like Bart Ehrman and Richard Carrier to Muslim scholars like Shabir Ally and Yusuf Ismail on the evidence for the Christian faith. Given the presence of phenomenological language used in a symbolic manner in both Jewish and Roman literature related to a major event such as death of an emperor… it seems to me that an understanding of the language in Matthew 27:52-53 as ‘special effects’ with eschatological Jewish texts and thought in mind is most plausible. It seems best to regard this difficult text in Matthew [27:51-53] as a poetic device added to communicate that the Son of God had died. It can forthrightly be admitted that the data surrounding what happened to Jesus is fragmentary and could possibly be mixed with legend… We may also be reading poetic language or legend at certain points, such as Matthew’s report of the raising of some dead saints at Jesus’ death (Mt 27:51-54). There is somewhat of a consensus among contemporary scholars that the Gospels belong to the genre of Greco-Roman biography (bios). Bioi offered the ancient biography great flexibility for rearranging material and inventing speeches in order to communicate the teachings, philosophy, and political beliefs of the subject, and they often included legend. Because bios was a flexible genre, it is often difficult to determine where history ends and legend begins. Some embellishments are present… A possible candidate for embellishment is Jn. 18:4-6. Even supporters of Dr. Licona—like Paul Copan—have stated that the genre of “legend” in the NT “understandably raises red flags.” Since publishing in 2010, Dr. Licona clarified that Matthew’s language was not poetic, but apocalyptic. Yet to the best of this author’s knowledge, he has yet to recant his statement about the NT incorporating legendary material—though if he wished to recant his use of Matthew using the genre of poetry, then he probably recanted Matthew’s use of legend as well. Is Matthew 27:51-53 a case of the “apocalyptic genre”? “Many bodies of the saints who had fallen asleep were raised (egeiro)” (v.52). Is this statement in the historical genre or in the apocalyptic genre? Of course, all evangelicals would believe that this statement is historical. Yet this would mean that Matthew has (again) shifted from the historical genre for Jesus’ death to the apocalyptic genre without signifying this. Luke uses this same Greek word for Jesus’ appearances in Acts 10:40-41 (Jesus “had become visible [emthanes]… to eyewitnesses”). An earthquake accompanies Jesus’ resurrection in Matthew 28:2 (“a severe earthquake had occurred”). The same language of being afraid of supernatural events accompanies the guards at Jesus’ resurrection who “shook for fear of him and became like dead men” (Mt. 28:4), as well as the women who “left the tomb quickly with fear and great joy and ran to report it to His disciples” (Mt. 28:8). Moreover, why would literal guards be afraid of events that didn’t actually happen? Third, the formula of death, resurrection, and appearances occurs for both the OT saints and Jesus’ resurrection. Matthew records that the tombs were opened (v.52), the saints were raised (v.52), and they appeared to many witnesses (v.53). Likewise, Paul records that Jesus was buried, risen, and appeared to many witnesses (1 Cor. 15:4-8). How does Dr. Licona account for a slippery slope in his hermeneutic? Dr. Licona acknowledges the difficulty of taking this section as non-historical. He writes, “If some or all of the phenomena reported at Jesus’ death are poetic devices, we may rightly ask whether Jesus’ resurrection is not more of the same.” Good question! Yet how does he answer this difficulty? He offers two arguments: (1) the early Christians didn’t interpret Jesus’ resurrection as poetic, and (2) Christian opponents didn’t interpret the Christian claim of the resurrection as poetic either. Dr. Michael Licona is an extraordinary scholar and avid defender of the Christian faith. We’re blessed to have such a strong mind in the Body of Christ, who gave us such a remarkable resource for the resurrection in his 2010 book The Resurrection of Jesus. While Paul calls us not to judge motives (1 Cor. 4:5), if I had to, I would think that Dr. Licona is not trying to undermine the authority of Scripture. Yet I can’t base my judgments on motives, but rather, on what he wrote. Based on his comments in his recent work, I find that his view breaks from the Chicago Statement on Biblical Inerrancy and Hermeneutics. Dr. Licona denies that Matthew is making an error. Instead he claims that Matthew is utilizing a non-historical genre in these three verses. Thus to him, this is an interpretive question—not a question of inerrancy. Yet if interpreters can import genres into a passage of Scripture—without sufficient justification—they could effectively purge the truth of any biblical text. The case against a poetic, legendary, or apocalyptic genre is so strong that if we import one here—without justification—I fear that we could import one anywhere for any difficult historical passage. Critics of my view will no doubt charge me with committing the “slippery slope” fallacy. This is committed when an individual states that a small issue can lead to bigger ones down the road without causal justification. For instance, some Christians commit this fallacy when they say that all drinking is immoral, because drinking can lead to drunkenness. But this is not so. Drinking is not a sin, rather drunkenness is a sin (see comments on 1 Tim. 5:23). Thus this would commit the “slippery slope” fallacy. Yet my case for Dr. Licona breaking from inerrancy is different: Denying the word of God—not matter how big or small—is a serious moral issue with large ramifications. This was the first sin in the Garden, when the Serpent asked the question, “Did God really say?” (Gen. 3:1 NIV) This small question led to massive problems to say the least! While drinking alcohol is not a sin, denying God’s word is a sin. Thus these two cases are disanalogous. I could accept Dr. Licona’s approach if he was making this case in the realm of apologetics, but instead, he’s making these statements in the realm of theology. To clarify, if Dr. Licona was saying, “We can still make a case for Jesus’ resurrection even if Matthew 27:52-53 is an error or embellishment of Matthew,” then I would surely agree. The historical case for Jesus’ resurrection is still strong even if we take the NT as non-inspired and sometimes errant documents. Yet once we make a case for Jesus’ authority, we need to ask what his view of the Bible was. And when we read through the words of Jesus, we discover that he believed in an inerrant Bible (see “A Case for Verbal Plenary Inspiration”). I pray, therefore, for this good Christian brother to reconsider his view on inerrancy. This is a time in the church where we need great minds like Dr. Licona’s to support the inerrancy of Scripture. Appendix A: How do other interpreters understand this passage? In favor of a poetic interpretation of the genre, Raymond Brown notes that this pericope contains a quatrain of two couplets, whereby Matthew uses kai plus a definite noun and verb. Yet Quarles notes that the symmetry breaks down in this section with additional “genitive modifers, participles, adjectives, prepositional phrases.” Moreover, he notes that other historical explanations of Jesus’ life might contain hymnic arrangement—but are nonetheless historical (as in 1 Pet. 3:18-19; Eph. 4:8; 1 Tim 3:16). While I disagree with Dr. Licona’s interpretation of Acts 2 (see Acts 2:16-21), it is surely possible to understand Acts 2 as apocalyptically fulfilled in Jesus. Surely such an interpretation does not break from inerrancy. Yet this passage is not analogous with Matthew 27:52-53. Matthew says nothing of fulfilling OT prophecy in his passage (as is his custom throughout his gospel), while Peter directly cites his source (Joel 2:28ff). Thus this isn’t a fair comparison. Acts 2 has a direct citation, while Matthew’s would be inferred at best. Moreover, throughout Matthew’s gospel, he states that Jesus was a historical and literal fulfillment of OT passages which may or may not be apocalyptic. However we understand Matthew’s use of prophecy and fulfillment (of which there are many interpretations), Matthew surely believed that Jesus was the historical fulfillment of these predicted events, as I’m sure Dr. Licona would agree. To believe that Matthew 27 is similar to Acts 2, we need to assert that (1) Jesus is fulfilling a prophecy Matthew doesn’t cite, (2) Matthew believed non-literal events could fulfill OT prophecy—even though this isn’t his consistent pattern through his gospel, and (3) something in the text would signify an apocalyptic genre being used—even though (as we’ve already seen) no hermeneutical warrant justifies this. In fact, the same supposed apocalyptic signifiers are also used of Jesus’ death and resurrection in the same context. More important than the use of an apocalyptic genre here, of course, is Dr. Licona’s use of language like “legend” and “embellishment” in his book, which are strictly out of bounds with inerrancy. 4. Matthew 27:52-53 is apocalyptic because Jesus uses apocalyptic language in his Olivet Discourse just three chapters earlier. Dr. Licona argues, “Similar phenomenal language appears in Jesus’ Olivet Discourse in Matthew 24 where the sun and moon will go dark and the stars will fall out of the sky.” Yet as Dr. Michael Kruger has pointed out, this isn’t a fair analogy either, because Matthew 24 describes the future—not the past. Since Jesus is clearly predicting the future in Matthew 24, this is clearly different than Matthew 27 describing historical events without any sort of signifier to the contrary (as we have in the case of Matthew 24). James Rochford, “Inerrancy.” This article covers the definition of inerrancy and some of the reasons for holding to it. Michael Licona, “Press Release: Michael Licona Response to Norm Geisler.” September 8, 2011. Michael Licona, “When the Saints Go Marching In (Matthew 27:52-53): Historicity, Apocalyptic Symbol, and Biblical Inerrancy.” Paper for Evangelical Philosophical Society. 2011. Albert Mohler, “The Devil is in the Details: Biblical Inerrancy and the Licona Controversy.” September 14, 2011. William Lane Craig, “QUESTION #69: Qualms about the Resurrection of Jesus.” August 11, 2008. Danny Akin, Craig Blomberg, Paul Copan, Michael Kruger, Michael Licona, and Charles Quarles. 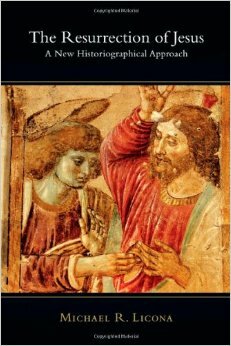 “A Roundtable Discussion with Michael Licona on The Resurrection of Jesus: A New Historiographical Approach.” Southern Theological Review. 3/1 (Summer 2012). Charles L. Quarles, “Review of Michael R. Licona, The Resurrection of Jesus: A New Historiographical Approach (Downers Grove, IL: IVP Academic, 2010),” JETS 54 (2011): 839-44. Licona, Michael. The Resurrection of Jesus: A New Historiographical Approach. Downers Grove, IL: IVP Academic, 2010. 306. Licona, Michael. The Resurrection of Jesus: A New Historiographical Approach. Downers Grove, IL: IVP Academic, 2010. 185-186. Licona, Michael. The Resurrection of Jesus: A New Historiographical Approach. Downers Grove, IL: IVP Academic, 2010. 34. Arndt, W., Danker, F. W., & Bauer, W. (2000). A Greek-English lexicon of the New Testament and other early Christian literature (3rd ed., p. 660). Chicago: University of Chicago Press. Danny Akin, Craig Blomberg, Paul Copan, Michael Kruger, Michael Licona, and Charles Quarles. “A Roundtable Discussion with Michael Licona on The Resurrection of Jesus: A New Historiographical Approach.” Southern Theological Review. 3/1 (Summer 2012). 79. Danny Akin, Craig Blomberg, Paul Copan, Michael Kruger, Michael Licona, and Charles Quarles. “A Roundtable Discussion with Michael Licona on The Resurrection of Jesus: A New Historiographical Approach.” Southern Theological Review. 3/1 (Summer 2012). 76. Licona, Michael. The Resurrection of Jesus: A New Historiographical Approach. Downers Grove, IL: IVP Academic, 2010. 553. Charles L. Quarles, “Review of Michael R. Licona, The Resurrection of Jesus: A New Historiographical Approach (Downers Grove, IL: IVP Academic, 2010),” JETS 54 (2011): 842. Licona stated, “I would only be denying the inerrancy of the text if I knew that Matthew meant for his readers to understand the raised saints in a literal-historical sense but was interpreting them as an apocalyptic symbol anyway. So, this is a matter of hermeneutics rather than inerrancy.” Danny Akin, Craig Blomberg, Paul Copan, Michael Kruger, Michael Licona, and Charles Quarles. “A Roundtable Discussion with Michael Licona on The Resurrection of Jesus: A New Historiographical Approach.” Southern Theological Review. 3/1 (Summer 2012). 79. Carson, D. A. Matthew. In F. E. Gaebelein (Ed. ), The Expositor’s Bible Commentary: Matthew, Mark, Luke (Vol. 8). Grand Rapids, MI: Zondervan Publishing House. 1984. 582. Hagner, Donald. Matthew 14–28 (Vol. 33B). Dallas: Word, Incorporated. 1998. 848. Keener, Craig. Matthew (Vol. 1). Downers Grove, IL: InterVarsity Press. 1997. In location. France, R. T. (1985). Matthew: an introduction and commentary (Vol. 1, p. 407). Downers Grove, IL: InterVarsity Press. Turner, D. L. (2008). Matthew (p. 670). Grand Rapids, MI: Baker Academic. Mounce, Robert. Matthew. Grand Rapids, MI: Baker Books. 2011. 260. Green, Michael. The message of Matthew: the kingdom of heaven (pp. 302–303). Leicester, England; Downers Grove, IL: InterVarsity Press. 2001. 302-303. Charles L. Quarles, “Review of Michael R. Licona, The Resurrection of Jesus: A New Historiographical Approach (Downers Grove, IL: IVP Academic, 2010),” JETS 54 (2011): 843. Danny Akin, Craig Blomberg, Paul Copan, Michael Kruger, Michael Licona, and Charles Quarles. “A Roundtable Discussion with Michael Licona on The Resurrection of Jesus: A New Historiographical Approach.” Southern Theological Review. 3/1 (Summer 2012). 74. Danny Akin, Craig Blomberg, Paul Copan, Michael Kruger, Michael Licona, and Charles Quarles. “A Roundtable Discussion with Michael Licona on The Resurrection of Jesus: A New Historiographical Approach.” Southern Theological Review. 3/1 (Summer 2012). 84.